Just like a bridge can’t open to traffic until its infrastructure is complete, your company can’t reach its full potential for visibility, leads, and new business until your marketing infrastructure is solid. Do you have the people, technology, and commitment in place to make your marketing program successful? Verify you have all of the fundamental pieces of marketing infrastructure with our free checklist. Marketing Database, Clean and Current — You can’t deliver marketing to your target markets if you don’t have the right list constructed the right way. 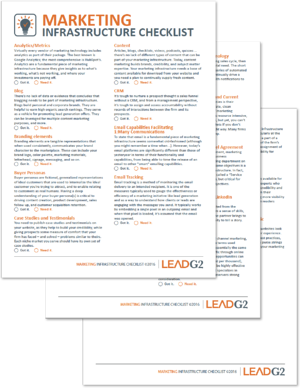 Firm Leader Marketing Champions — Are leaders stepping up to the plate as responsible, engaged champions of marketing? Strategic Marketing Plan — This plan needs to be a part of a Service Level Agreement and a reflection of priorities in terms of resource allocation, assignment of responsibilities, and accountability for results. FILL OUT THE FORM TO GET THE FULL CHECKLIST.